The Starline SG1000 optical node is the perfect solution for system operators expanding fiber rich architectures with non-redundant, cost-effective optical nodes. Its compact size, flexible fiber management system and straightforward electronics package simplifies installation in both strand and pedestal applications. It supports 870 MHz in the forward passband utilizing an integrated optical receiver and either Silicon or Gallium Arsenide hybrid technology. The Starline SG1000 optical node features one or two high-performance RF outputs, and can be field configured with passive accessories to activate a third RF port. Several different models of 1310 nm return transmitters from -4 to 3 dBm (0.4 to 2mW) are available to configure the return path, depending on data or video applications. 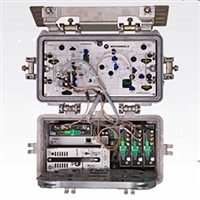 This full-featured optical node is available with optional ingress control switches and a status monitoring transponder. The SG2000 supports redundant 60/90 volt powering and dual powering is also available, enabling to accept two independent AC sources for maximum reliability. Currently rated to pass 15 amperes, the SG2000’s electronics chassis implements ergonomic hot-swappable plug-ins for rapid replacement in the field. Fully configured to meet specific system requirements, the SG2000 is the answer in an expanding global market, as it fulfills the latest demands of one-way and two-way broadband network applications, including broadcast video, telephony, and data. The Starline SG2440 Scalable Optical Node provides the capability for the system operator to independently and incrementally segment downstream and upstream sections of the node without discarding the initial platform investment. The Starline SG2440 provides an ideal solution for a wide range of networks – from traditional fiber-to-feeder to fiber-deep architectures – that must evolve with the implementation of advanced services such as telephony, Video-On-Demand (VOD) and IP data. The Starline SG2440 is a major upgrade of the capabilities of the SG2000, with a new electronics pack, lid motherboard and broadcast receiver. The flexibility of the Starline SG2440’s forward path offers the system operator several options in providing targeted services and unique programming to smaller service areas. Splitting the node service area in half is accomplished by adding a second broadcast receiver and replacing the forward configuration plug-in board. The Starline SG2440 complements Motorola’s Digital Return technology to achieve greater upstream bandwidth efficiency. The Motorola Starline SG4000 modular optical node provides operators with an unprecedented level of performance and flexibility. With provisions for up to nine optics modules, the SG4000 scales from its most basic version to full 4x4 capability without any loss of initial investment and with minimal service interruptions. Customers will benefit from its expandable, flexible configurations that allow station growth without any up-front price penalty. Featuring all new module designs, the SG4000 builds on Motorola's heritage of reliability and performance. The forward path uses Motorola Proprietary Enhanced Gallium Arsenide (E-GaAs) technology to deliver broadcast video and data over the entire 40 - 870 MHz passband. As a platform for Motorola's high-speed Time Domain Multiplexed (TDM) digital return, the SG4000 effectively combines node segmentation with wavelength aggregation, conserving fiber resources. Available with a Hybrid Management Sub-Layer (HMS) compatible status monitor transponder, the SG4000 supports today's evolving HFC networks. The BTN-2 Broadband Telecommunications Node addresses the growing demand for a cost-effective solution for fiber rich architectures. The BTN-2 Broadband Telecommunications Node is designed to support advanced two-way services such as telephony, cable modems, and video on demand. Fully configured to meet your specific system requirements, the BTN-2 Broadband Telecommunications Node demonstrates Motorola's commitment to providing innovative products with advanced capability to act as a bridge to the future of the HFC broadband industry. 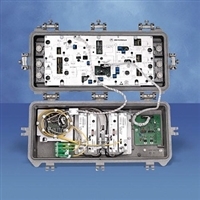 The BTN-2 Broadband Telecommunications Node performs lightwave to RF and RF to lightwave conversion in an optical transmission link supporting a variety of advanced hybrid fiber/coaxial network architectures. 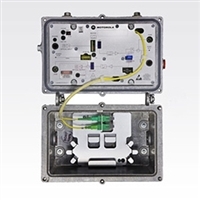 The BTN-2 Broadband Telecommunications Node supports an 870 MHz passband, provides for improved distortion performance and extended transmission distances, increased system reliability and reduced system maintenance. With the BTN-2 Broadband Telecommunications Node you have a scalable solution for deployment in broadband systems. It can be configured for two-way operation as required. 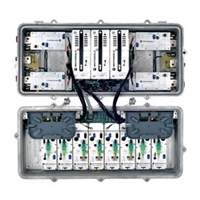 The BTN-2 Broadband Telecommunications Node optimizes your station space by allowing up to four optical modules: two optical receivers and two optical transmitters. This design gives you maximum flexibility to support your changing needs,making it ideal for telephony and other advanced applications where redundancy capability and field upgradeability/configurability are paramount concerns. The return path can be configured with a single optical transmitter or a RF amplifier output. Return path transmitter options include a 0.4 mw isolated Fabry-Perot transmitter (IFPT), a 0.4 mw non- isolated Fabry-Perot transmitter (FPT), a 1.0 mw or 2.0 mw isolated distributed feedback transmitter (DFBT). In addition, optional ingress switching capability via Headend control software allows the operator to identify and isolate ingress problems and mitigate the effects. 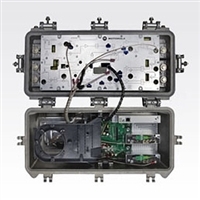 Motorola’s 1 GHz STARLINE® Mini-Bridger® series optical node, model MBN100, leads the industry in features and performance and is designed to meet the needs of today's expanding broadband communication networks. This optical node provides the perfect solution for system operators who need to deploy fiber deeper into their architecture with the flexibility to expand later. The MBN100 node can be deployed as a stand alone compact sized fiber deep node or to convert an existing Minibridger® amplifier to an optical node. The base of the MBN100 node is the same as the MB100 amplifier and can allow operators to leave the hard line coax cable installed when segmenting at an amplifier location. 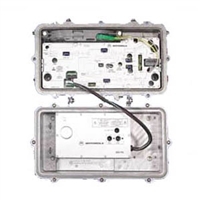 The 1 GHz Starline® BLN100 is backward compatible with the substantial installation of the Motorola Broadband Line Extender (BLE) amplifier housing base. The benefit of the BLN100 is that it can easily convert existing amplifier locations to optical nodes by extending fiber outward from the main node or splice enclosure. This type of node segmentation, using satellite or fiber deep nodes, is an incremental step toward extending fiber closer to the premises and leveraging the existing HFC infrastructure to deliver higher bandwidth per subscriber. The Motorola 1 GHz Starline® BT® series optical node, model BTN100, leads the industry in features and performance and is designed to meet the needs of today's expanding broadband communication networks. This optical node provides the perfect solution for system operators who need to deploy fiber deeper into their architecture with the flexibility to expand later. The BTN100 node can be deployed as a low-cost, four-output, stand-alone fiber deep node or to convert an existing BT amplifier into an optical node. The bases of the BTN100 node and the BT100 amplifier are the same, allowing operators to leave the hard-line coax cable installed when segmenting at an amplifier location.